Aquaponics is a method of food production which utilizes two sustainable technologies simultaneously to create an abundance of food. 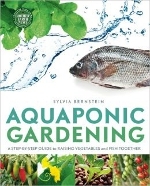 Whereas conventional food production uses chemical pesticides to fertilize and nourish plant growth, aquaponics uses the wastes from one system to fertilize another in an endless cycle of growth. 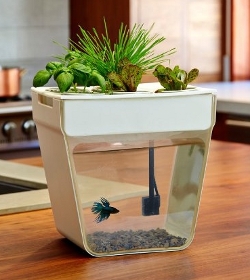 What Food Can Be Produced with Aquaponics? Like all living creatures, fish eat, digest, and then excrete waste. If the waste produced by fish is not removed from their living space, it can prevent them from taking up oxygen and cause gill damage. Fish waste is rich in ammonia, and bacteria convert it into forms of nitrogen that are bioavailable to plants. This nutrient rich water created by the fish then becomes the perfect plant feed and is used to nourish the plants growing hydroponically. The plants then uptake the nutrients, which filters and cleans the water before it returns back to the fish in a closed loop system. Fish are the most efficient converters of feed into human food of all the farming livestock, generating 1 pound of food for every 1.2 kilograms of feed. 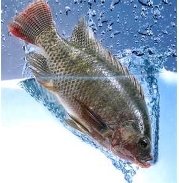 Many people agree that the ideal fish for an aquaponics system is Tilapia. Catfish can also be a good choice. 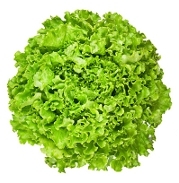 Almost any vegetable you can think of can be grown hydroponically using 90% less water than conventional farming. After vegetables have been grown, the leaves, stems, and roots of the plants (which are not used for food) can then be vermicomposted to produce big, healthy worms. 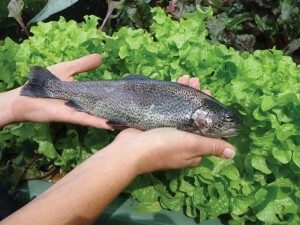 The worms can then be fed to the fish to make them even healthier, and reduce the amount of feed required to sustain the aquatic life in your aquaponics system. By adding Black Soldier Flies to a container with the fish waste (head, guts, bones, skin), they will consume the waste and become a nutrient-rich food source for chickens. 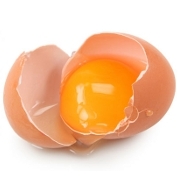 You can then feed these organisms to chickens, which will then produce eggs. With nutrient-rich water comes the production of algae. 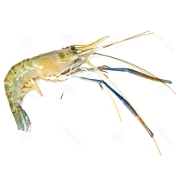 Giant Freshwater Prawns can then be added to the water to consume the algae and become another food source in your aquaponics ecosystem. 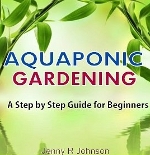 Depending on the scale and amount of food you want to produce, there are many ways to build an aquaponics system. The Urban Farming Guys on YouTube have made a fantastic video which shares some valuable insight into how to build an aquaponics system. 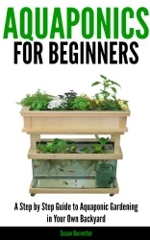 Below that are some books on aquaponics, as well as a ready-to-go small scale aquaponics system you can use to begin your sustainable aquaponics ecosystem today.